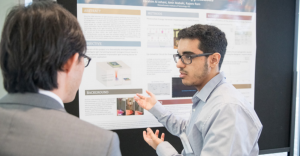 Undergraduate research was a highlight of the MIT Energy Initiative (MITEI) Annual Research Conference for the first time in December 2017, as 15 students presented posters of energy-related work in a wide range of disciplines from electrochemistry to architecture. The conference, which took place December 5–6 in the MIT Media Lab, offered students a rare opportunity to network with a wide range of energy professionals while showcasing research skills and training applicable to future careers. All the poster presenters were MITEI-sponsored participants in the Undergraduate Research Opportunities Program (UROP), which gives students hands-on research experience. The undergraduates applied for the program in April 2017 and then spent approximately 10 weeks of the summer working for faculty on a rich variety of projects. 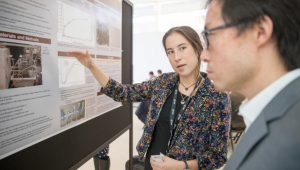 Rayna Higuchi ’20, a civil and environmental engineering major, conducted research on directed evolution in hopes of producing bacteria that can degrade toxic compounds. She says she enjoyed presenting her work at the conference because it prompted her to consider how the work might be applicable to industry. “That was interesting to think about,” she says. 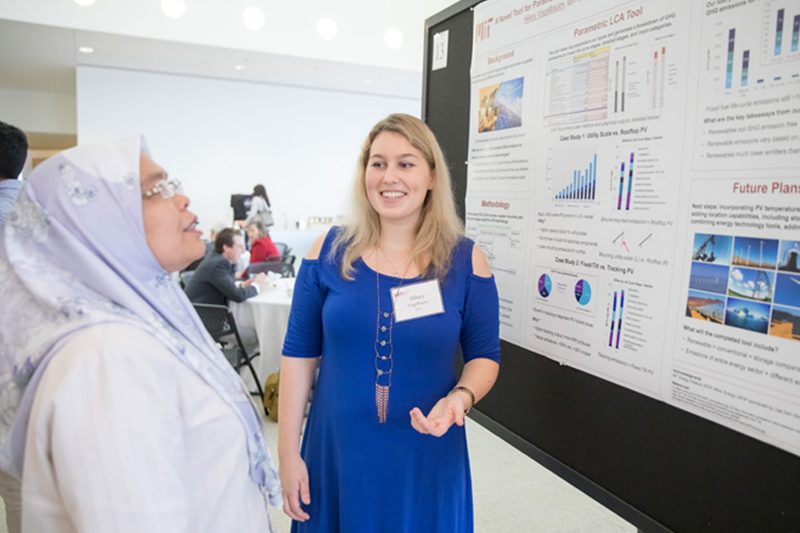 Vogelbaum, whose ambition is to become “a voice of influence in the energy industry,” says the conference presented an ideal opportunity for her to meet professionals. “Getting connected to people in all parts of industry…is especially important for me,” she says. MITEI has sponsored UROP students for many years, but the conference poster session was added this year because MITEI Education Director Antje Danielson thought having such a high-profile project would enhance the UROP experience. MITEI’s UROP students were sponsored by leading companies as well as by individuals, and several sponsors who attended the conference say they were quite impressed by the undergraduates’ research. Michael Pomrehn, sales and innovation manager at Shell in Hamburg, Germany, was so impressed with the work of UROP student Caralyn Cutlip ’18 that he has since arranged for her to do an internship at Shell—with the possibility that the assignment could lead to a full-time job. A mechanical engineering major, Cutlip investigated passive cooling for low-cost housing—work that dovetails with Shell’s interest in home energy, Pomrehn says. To learn more about the goals of the Energy UROP program, please visit energy.mit.edu/urop.